Total Workshop search results: 8. Displaying Page 1 of your woodworking search phrase CRIB TABLE. If you lack wall space, mount the fretwork scene in a simple stand to display on a table, shelf, mantle, etc. We show a very basic example here, but you may add decorative options as described in the plan. This sofa table would make a beautiful addition to any room and can also be used as a hall or console table. Link Type: free plans | Link Source: Scribd | Visit the category | Fix Link? By Matthew Power - This 3 page PDF document transcribes the original table measurements. You need the Adobe Acrobat Reader software to view the PDF document at this link. Link Type: free plans | Link Source: CurrentMiddleAges | Visit the category | Fix Link? This project tests your skills as an inlayer. The reason is: the three shelves of this light round table shelf are inlaid with geometrical patterns as described in the page Geometrical Veneer Inlays. Link Type: free plans | Link Source: Pete Mullard | Visit the category | Fix Link? In a short evening, you can turn a few scraps of wood into an accurate, easy-to-use layout tool. It is tough to beat a marking gauge for creating crisp, repeatable layout lines. Consisting of a beam, a sliding fence held in place by a small wedge, and a scribing point, this time-tested tool sets up quickly. Enlarged images of patterns are PDFs. Link Type: free plans | Link Source: WOOD Magazine | Visit the category | Fix Link? Just right - is what can describe the size of this project. Or build only the lower half for an attractive and compact storage cabinet suitable for any room in your home. Not so big that it dominates a kitchen or dining room, but big enough to offer ample storage and display space. The lower cabinet alone makes an attractive sideboard. Simple joinery includes rabbet joints for the drawers, and stub tenons and grooves for the doors. 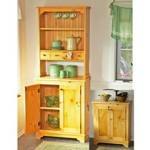 To minimize expenses, use low-cost pine found at home centers. As a bonus, we have added a special feature on working with knots. Although a common nuisance, when featured prominently, knots can become a striking focal point in your project. Build this low-rise crib which is adjustable to three different heights… side rail removes to make a toddler bed. Link Type: free plans | Link Source: Design Confidential | Visit the category | Fix Link? A picnic table is a project you can buy all the material for and build in a day. Relatively simple and straight forward you can build a table that will last for decades. The table I will describe here is a large one, 28 inches wide (table top) and 8 ft long. It has benches attached to the table and is stable and strong. Certainly you can modify these plans to meet your needs. I have one that has a top that is 4 ft square based on the same design. Link Type: free plans | Link Source: HandymanUSA | Visit the category | Fix Link?